The day after last week’s Snowpocalypse, we wanted to put all the white stuff and shovelling behind us with a meal that had nothing to do with winter. Congolese chicken, we thought, might just do the trick. Not that we knew what Congolese chicken would taste like. We would need to make our first visit to Holland Kisa Grill, which opened last fall where the Red Sea Café was on Holland Avenue’s restaurant row north of Wellington Street West. Even then, what little information the restaurant offers on its menu is more intriguing than descriptive. The chicken there is “seasoned with spices of the Bayou Djakarta style,” says the menu, leaving us to wonder whether this Congolese food would taste of Louisiana or Indonesia. We had our fingers crossed, because we’re big fans of the spicy, charcoal-grilled birds served by some of Ottawa’s West African restaurants, and we wondered how chicken prepared by a central African establishment would compare. Holland Kisa Grill, the sister restaurant of Grillade Kisanola in Gatineau, also promises the smoky appeal of charcoal-grilled meat. The restaurant, we found, was modest in more than a few ways. It seats about 20, and its decor is dominated by a Renoir print and a large TV that I’ve not seen in use during my three visits. Its menu is compact, lacking in desserts. Also, some items listed on the menu weren’t always available. A liquor license application is in the works, we’re told. We’ve experienced delays in getting food because, in one instance, staffing was limited to one person who was cooking and serving. Still, there’s pride here about the food. After all, this is a place where the Wi-Fi password refers to the eatery’s superior chicken. It turned out that the chicken was quite good — not the best in town, by our tastes, but definitely seasoned appealingly and enjoyable to eat. Not so much spicy as deeply savoury, brusquely hacked, bone-in chicken pieces yielded moist, flavourful meat after sufficient prying. Grilled goat involved more chewing, but the salty yet intriguingly dusky seasoning made the effort worthwhile. Whole grilled dorade, which anglophones would call bream, was a winner thanks to the flavour boost of a perky relish-like sauce made with lemongrass and coriander, although eating it did involve grappling with or spitting out many small bones. We wanted to try the house-made samosas, but were told that the kitchen was out. A few days later, I ordered some to go and wound up waiting 20 minutes longer than the 40 minutes I was told it would take to prepare them. (That Wi-Fi password came in handy.) The beef samosas (neither chicken nor shrimp, both listed, were available) were crisp and tasty, although awfully oily too. My final visit was made this week to sample the eatery’s brochettes at lunch, and to see if these $11.99 options provided better value than the pricier dinners. Of the chicken, goat and beef brochettes, the chicken was clearly the best, as per the Wi-Fi password. Seasoned winningly as the chicken pieces at dinner had been, the boneless pieces were sufficiently moist. Both the goat and beef tasted basically of themselves and charcoal, but were tough and dry. 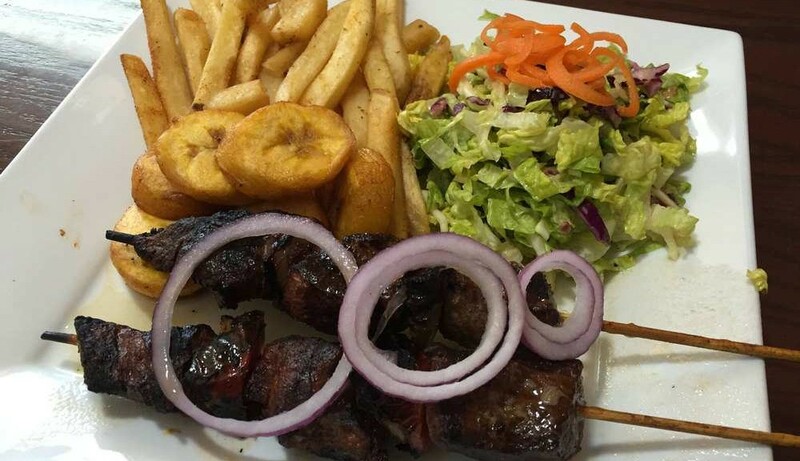 All dishes have come with mounds of very ordinary salad, and something starchy (fries, plantains, rice and beans). The plump, just-cooked, ungreasy plantains were always a cut above the other choices. So, some kinks and omissions seem still to be worked out at Holland Kisa Grill. Unique flavourings and friendly service both count for something, but unavailabilities, slowness and tough meat detract. Until the eatery raises its bar, chicken and plantains seem like the best bets for a simple but satisfying meal.